Electric cars may still play second fiddle to gas-guzzlers here on Earth, but they've dominated the Martian driving scene for more than a decade. NASA's tiny Sojourner rover hit the red dirt in 1997, followed by the golf-cart-size twins Spirit and Opportunity in 2004. And last August, the 1-ton Curiosity rover dropped in to determine whether Mars could ever have supported microbial life. "On Mars, there was no other option," said Curiosity strategic uplink lead Nagin Cox, of NASA's Jet Propulsion Laboratory in Pasadena, Calif. "There isn't a gas station." This grouping of two test rovers and a flight spare provides a graphic comparison of three generations of Mars rovers developed at NASA's Jet Propulsion Laboratory, Pasadena, Calif. The setting is JPL's Mars Yard testing area. Front and center is the flight spare for the first Mars rover, Sojourner, which landed on Mars in 1997 as part of the Mars Pathfinder Project. On the left is a Mars Exploration Rover Project test rover that is a working sibling to Spirit and Opportunity, which landed on Mars in 2004. On the right is a Mars Science Laboratory test rover the size of that project's Mars rover, Curiosity, which is on course for landing on Mars in August 2012. Most electric cars on the road today rely on lithium-ion batteries, which must be plugged in and recharged on a regular basis. Mars rovers are millions of miles from the nearest electrical outlets or charging station, so they take a different tack. The 25-lb. (11.5 kilograms) Sojourner generated electricity using solar arrays, with a set of three small, nonrechargeable lithium-thionyl chloride batteries serving as backup. The much larger Spirit and Opportunity also rely primarily on solar panels. Unlike Sojourner, however, they sport rechargeable lithium-ion batteries, which allow them greater functionality when the sun isn't shining. 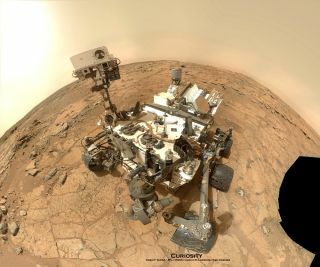 Curiosity, on the other hand, is powered by a radioisotope thermoelectric generator (RTG), which converts the heat generated by the radioactive decay of plutonium-238 into electricity. RTGs have powered many NASA deep-space probes over the decades, including the twin Voyager spacecraft, which are knocking on the door of interstellar space. "The batteries enable Curiosity's power subsystem to meet peak power demands of rover activities when the demand temporarily exceeds the onboard multi-mission radioisotope thermoelectric generator (MMRTG) steady output level," the Curiosity team wrote in a mission update shortly before the rover's nerve-wracking landing, which saw it lowered to the Martian surface on cables by a rocket-powered sky crane. NASA's 25-pound Sojourner Mars rover covered about 330 feet (100 meters) over 83 days on the Red Planet in 1997. As battery technology improves, electric cars on Earth are getting better and better, with greater power and increased range. The baseline configuration of Tesla's Model S, for example, can go 208 miles (335 kilometers) on one charge and accelerate from 0 to 60 mph (97 km/h) in 5.9 seconds, according to the company. Mars rovers keep improving with each iteration as well. Sojourner carried one science instrument and three cameras, and it lasted 83 days on Mars before conking out. Spirit and Opportunity have six engineering cameras and three science cameras, along with three other scientific instruments. While both rovers were originally tasked with three-month prime missions to seek signs of past water activity on Mars, Spirit was just declared dead in 2011. Opportunity is still going strong after more than nine years on the Red Planet, and just broke the American record for longest distance traveled on the surface of another world. "One thing we've definitely learned is, never bet against Opportunity," Cox, who also has experience working on Spirit and Opportunity's mission, told SPACE.com. Curiosity is the biggest and most advanced Mars rover yet, NASA officials say. It sports 10 different scientific instruments and 17 cameras, and its RTG could keep powering the robot for a decade or more. Curiosity and its kin are built for science, not speed, so they can't keep up with the Model S or any other electric car on the market today. Curiosity's top speed on flat, hard ground is 1.5 inches per second, which works out to 0.09 mph (0.14 km/h). Because they're so slow and steady, Mars rovers also can't compete with terrestrial electrical vehicles (EVs) in terms of range. Sojourner traveled a total of 330 feet (100 meters), while Spirit put 4.80 miles (7.73 km) on its odometer. Opportunity has covered 22.20 miles (35.76 km) thus far, just short of the all-time record for most distance traveled by a robot on the surface of another world. The Soviet Union's Lunokhod 2 rover traveled 23 miles (37 km) on the moon in 1973. Curiosity has covered just 2,300 feet (700 m) since its arrival on the Red Planet. But the rover should embark on an epic 5-mile (8 km) drive to the base of the mysterious 3.4-mile-high (5.5 km) Mount Sharp in the next month or so, mission scientists say. Cox and her husband are electric-car advocates and aficionados. They own a Nissan Leaf and share a Tesla Roadster with relatives, and they once had an EV1 — the first mass-produced electric vehicle of the modern era, which General Motors manufactured in the late 1990s. Electricity will power Mars rovers for the foreseeable future. Cox expressed hope that EVs will become a bigger part of the driving picture here on Earth as well, helping humanity avoid the worst consequences of climate change. "I think EVs are helping us learn how to coexist on the Earth without using it up, at the same time that they're helping us extend our reach to Mars and explore places that we couldn't reach without those technologies," she said.